Twelve suspects are being held by police in the Paris region over last week's attacks in the French capital that killed 17 people. They are being questioned about "possible logistical support", such as weapons or vehicles, they could have given the three gunmen, police say. Police conducted raids in five towns in the Paris region. Last week's violence began with an attack by two gunmen on Charlie Hebdo magazine, which left 12 people dead. A day later - on 8 January - a policewoman was shot dead by gunman Amedy Coulibaly while responding to a traffic accident in the south of Paris. 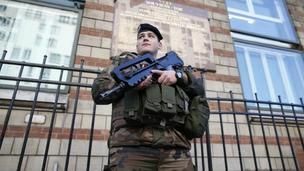 Four more people who were held hostage by Coulibaly were killed on 9 January when police stormed a kosher supermarket. Coulibaly was shot dead by police. Police also killed the two gunmen responsible for the Charlie Hebdo attack - Said and Cherif Kouachi - outside a warehouse near Paris earlier that day. 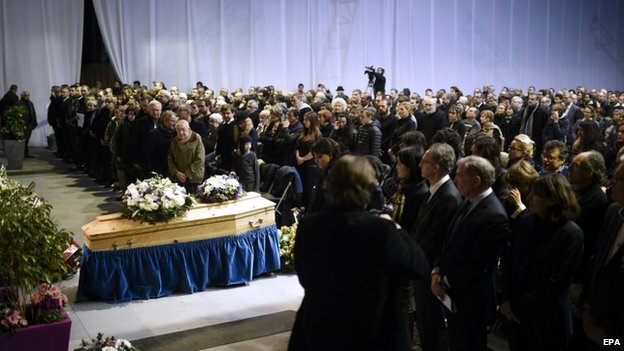 Three members of the magazine's staff were buried on Friday, including the editor Stephane Charbonnier, also known as Charb. Bagpipers played Amazing Grace at his funeral in the Pontoise district of Paris. In the latest development, police carried out raids in the towns of Montrouge, Grigny, Chatenay-Malabry, Epinay-sur-Seine and Fleury-Merogis overnight, iTele reported. Also on Friday, the Gare de l'Est train station in Paris was evacuated for an hour over a bomb threat, train operator SNCF told the BBC. Services resumed at 09:00 local time (08:00 GMT), SNCF said, without giving further details. 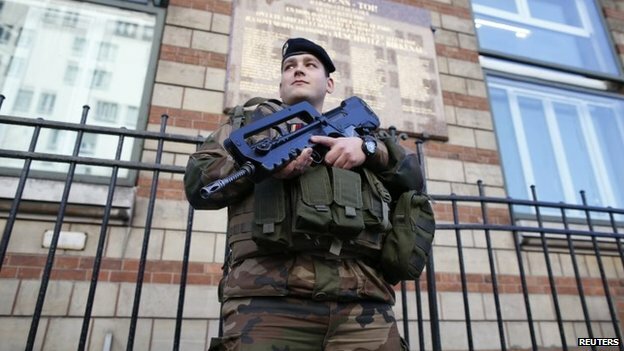 French authorities say that about 120,000 police and soldiers are now mobilised across France and that anti-terror plans remain in place. Prime Minister Manuel Valls said on Friday that France and Belgium were facing the same threats, but added that there were no links between the events in France and Belgium's anti-terror raid on Thursday. Spain has also launched an inquiry after it was revealed that one of the Paris gunmen, Amedy Coulibaly, had visited Madrid days before the attacks. 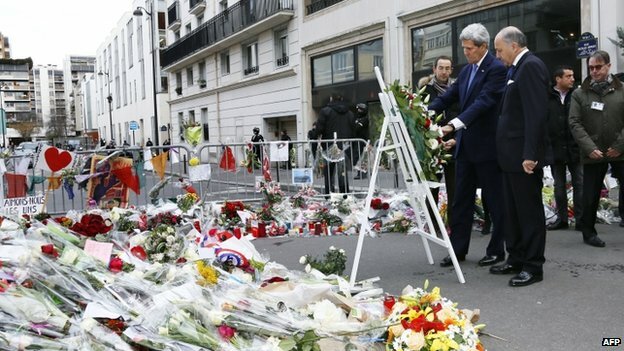 US Secretary of State John Kerry is in Paris to pay tribute to those killed in the attacks. He hugged French President Francois Hollande, saying: "We share the pain and the horror of everything that you went through." Mr Hollande said: "You've been victims yourself of an exceptional terrorist attack on September 11 . You know what it means for a country." "We must find together appropriate responses," Mr Hollande added. Mr Kerry laid wreaths outside the Jewish supermarket and the Charlie Hebdo offices. Later on Friday, he will meet Paris mayor Anne Hidalgo for a remembrance ceremony. The White House had admitted an error in not sending a higher-profile representative to last Sunday's unity march in Paris, which was attended by more than 40 world leaders. The US ambassador to France attended. 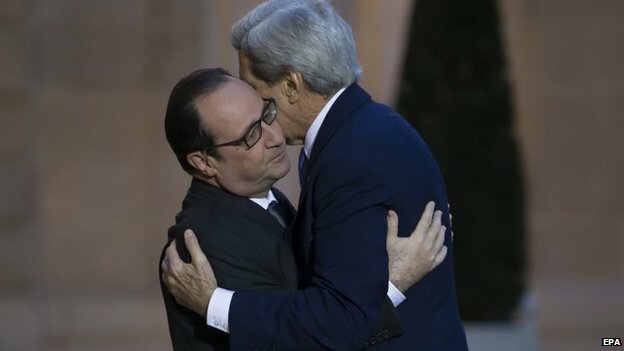 French Foreign Minister Laurent Fabius said that Mr Kerry had "apologised" for missing the unity march, AFP reported. Mr Kerry said that he had been unable to attend because he was visiting Bulgaria and India at the time. Meanwhile, German police say they have arrested two men following raids early on Friday. One of the men was suspected of leading an extremist group of Turkish and Russian nationals, police added. The group was suspected of "preparing a serious act of violence against the state in Syria", police said, but there was "no indication that the group was preparing attacks inside Germany". Some 250 officers were involved in the raids on 11 properties, the BBC's Jenny Hill in Berlin reports.